Opening hours: Business hours are from 9.30 am to 1.30 pm and from 5 pm to 8 pm. Supermarkets and department stores are generally open from 9.30 am to 9.30 pm. Bars, pubs and clubs are generally open until 3 am or 4 am in the morning on weekdays and until the early hours of the morning on weekends. Enjoy the breathtaking views of the sea as you descend into the prehistoric, concealed cave system once used by tobacco and liquor smugglers. 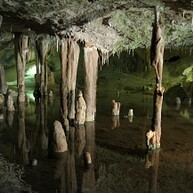 Stalagmites and stalactites adorn the cave and at the centre there’s a 9 meter high water cascade. Tours take place every hour from 10.30 until sunset every day all year. This fortress used to be the military and administrative headquarters of the Moslem 'Wali'. Ruins from the 12th and 13th centuries have been uncovered here, although most buildings are from the 16th century. The Almudaina has been declared a World Heritage site. This beach lies in the northern part of the island and is still something of a hidden gem. The bay has clean water and steep cliffs as well as an appealing sandy beach. The Diocesan Museum features Ibizan jewellery from the 18th century and religious sculptures, such as the one of Rosary Virgin (Verge del Roser) and the Las Almas, which is quite spectacular with devil figures and demons. The cathedral is a combination of several different styles and time periods. It has a Gothic bell tower and a baroque interior, and is a definitively fascinating attraction for the history buff. Inside the cathedral lies the Museu Diocesà. Ibiza Horse Valley is a lovely sanctuary for horses that have been treated badly. Not only will you see the horses in the wild, but you can also go for a whole day horseback riding in the forest or swimming with the beautiful creatures. Iglesia del Puig de Missa is yet another location on the island of Ibiza that offers visitors amazing views. On the walk up to this 13th century church you will pass by many scenic spots; one tip is to go a bit later in the day when it is not too hot. 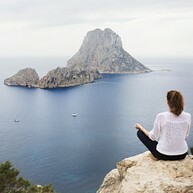 Despite Ibiza enjoying a reputation of being one of the best party islands in the world, many people visit the island because of the beautiful and tranquil yoga retreats. If you opt for spending your stay at one of those (LilyPod Yoga & Ayurveda, for example), you are guaranteed to fly home rejuvenated and recharged. 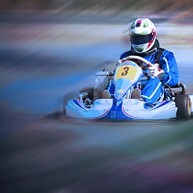 Speed, adrenaline and fun for the whole family! You can come here with children from 4 years old and up. It is one of the best ways to spend a couple of hours and a nice break from the lazy beach days. Who is the daredevil in your group? 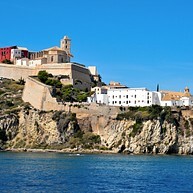 The Dalt Vila (old town) walls have been declared a World Heritage site by UNESCO. It was built in the 16th century as a defence fortification. 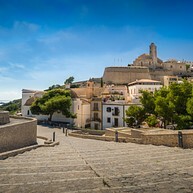 The narrow cobbled streets are well-preserved, and magnificent views await on top of the castle complex as well as by the Santa María Cathedral - the crown of the Dalt Vila. The outstanding gateway Portal de ses Taules can be found in the north wall. 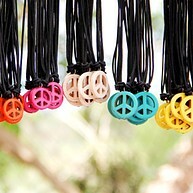 This enormous market offers a great choice of clothing and jewellery at low prices. 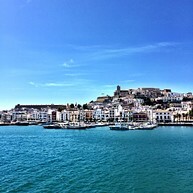 What once began as a small hippy market in the 1960s has now turned into one of Ibiza's major visitor attractions and prime shopping spots. 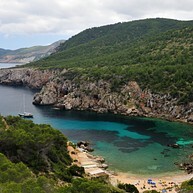 This amazing island right next to Ibiza boasts unspoiled beaches with crystal clear blue water. From the small port of La Savina, there are buses to other parts of the island, or you can hire a car, moped or bicycle from one of the nearby shops. You can grab a map from the port’s tourist office. Sights of interest include a 4 000-year-old Ca Na Costa sepulture, the Es Mirador restaurant and the beaches of Cala Saona, Illettes and Llevant.